The striking Ukrainian capital of Kiev (or Kyiv) is one of Eastern Europe's oldest cities and its fortunes have risen and fallen with the tides of history. The city, once capital of Old Rus, is believed to date back to the 5th century and was a key player in the expansion of the medieval East Slavic nation, as well as serving as a major centre for trade between the Mediterranean and the Baltic. By the 1200s, Kiev was one of the world's largest cities, but fell foul to invading Mongols in 1240, really only fully recovering in the 19th century during the Russian Revolution. 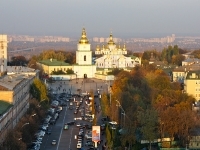 Much of the city and its treasures were again damaged during World War II, but Kiev still boasts a rich cultural heritage and a range of spectacular attractions. Many interesting museums, theatres, opera houses, historical buildings and gardens wait to be discovered in Kiev, laid out on either side of the picturesque Dnieper River. The western bank is home to the older part of the city and was, pre-urbanisation, characterised by its forested hills, as well as steep ravines and winding rivers, which serve as ice-rinks in winter. Watched over by a statue of the historic protector of Kiev, Michael Archangel, the city also boasts a successful blend of the old and the new. Modern buildings nestle against historical gems and cultural wonders rub shoulders with trendy, buzzing nightclubs, bars and restaurants. Any visit to the Ukraine is bound to start with an exploration of its capital, and visitors will need to ensure they give themselves ample time to explore all it has to offer. From the Golden Gate of Kiev, built in 1037, to a funicular ride up the steep western bank, Kiev has something for all tastes and certainly will not disappoint.